Summary: Using neuroimaging and mathematical graph theory, researchers discover it is possible to detect those at risk of developing psychosis by examining cortical folding. The anatomy of our brain can provide indications of the development of psychoses. Simplified representation of cortical folding in different brain regions. NeuroscienceNews.com image is credited to University Psychiatric Clinics Basel. Image Source: NeuroscienceNews.com image is credited to University Psychiatric Clinics Basel. Original Research: Open access research for “Disorganized Gyrification Network Properties During the Transition to Psychosis” by Tushar Das, PhD; Stefan Borgwardt, MD; Daniel J. Hauke, MSc; Fabienne Harrisberger, PhD; Undine E. Lang, MD; Anita Riecher-Rössler, MD; Lena Palaniyappan, MD; André Schmidt, PhD in JAMA Psychiatry. Published April 25 2018. 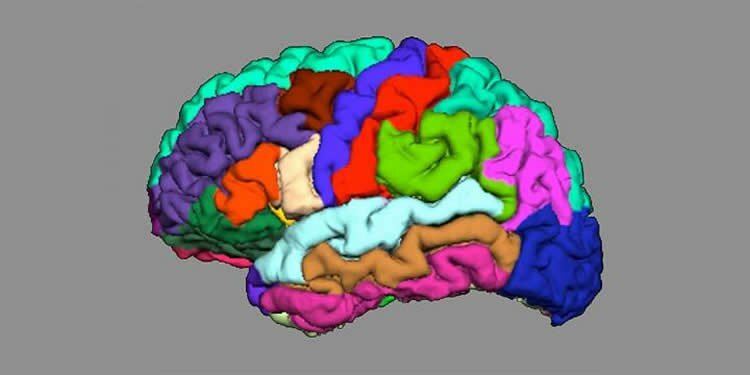 University of Basel “Indications of Psychosis Appear in Cortical Folding.” NeuroscienceNews. NeuroscienceNews, 25 April 2018. University of Basel “Indications of Psychosis Appear in Cortical Folding.” http://neurosciencenews.com/psychosis-cortical-folding-8877/ (accessed April 25, 2018). Importance There is urgent need to improve the limited prognostic accuracy of clinical instruments to predict psychosis onset in individuals at clinical high risk (CHR) for psychosis. As yet, no reliable biological marker has been established to delineate CHR individuals who will develop psychosis from those who will not. Objectives To investigate abnormalities in a graph-based gyrification connectome in the early stages of psychosis and to test the accuracy of this systems-based approach to predict a transition to psychosis among CHR individuals. Design, Setting, and Participants This investigation was a cross-sectional magnetic resonance imaging (MRI) study with follow-up assessment to determine the transition status of CHR individuals. Participants were recruited from a specialized clinic for the early detection of psychosis at the Department of Psychiatry (Universitäre Psychiatrische Kliniken [UPK]), University of Basel, Basel, Switzerland. Participants included individuals in the following 4 study groups: 44 healthy controls (HC group), 63 at-risk mental state (ARMS) individuals without later transition to psychosis (ARMS-NT group), 16 ARMS individuals with later transition to psychosis (ARMS-T group), and 38 antipsychotic-free patients with first-episode psychosis (FEP group). The study dates were November 2008 to November 2014. The dates of analysis were March to November 2017. Main Outcomes and Measures Gyrification-based structural covariance networks (connectomes) were constructed to quantify global integration, segregation, and small-worldness. Group differences in network measures were assessed using functional data analysis across a range of network densities. The extremely randomized trees algorithm with repeated 5-fold cross-validation was used to delineate ARMS-T individuals from ARMS-NT individuals. Permutation tests were conducted to assess the significance of classification performance measures. Results The 4 study groups comprised 161 participants with mean (SD) ages ranging from 24.0 (4.7) to 25.9 (5.7) years. Small-worldness was reduced in the ARMS-T and FEP groups and was associated with decreased integration and increased segregation in both groups (Hedges g range, 0.666-1.050). Using the connectome properties as features, a good classification performance was obtained (accuracy, 90.49%; balanced accuracy, 81.34%; positive predictive value, 84.47%; negative predictive value, 92.18%; sensitivity, 66.11%; specificity, 96.58%; and area under the curve, 88.30%). Conclusions and Relevance These findings suggest that there is poor integration in the coordinated development of cortical folding in patients who develop psychosis. These results further suggest that gyrification-based connectomes might be a promising means to generate systems-based measures from anatomical data to improve individual prediction of a transition to psychosis in CHR individuals. hola, muy buenos sus articulos !! me gustaria que publiquen mas informacion sobre adenomas hipofisitario, ya que mi hija lo tiene. desde ya muchas gracias. felicitaciones! !